From its earliest days through its very last hurrah (see the Art in the Armory: Occupied Territory exhibition) visiting groups used the fortress-like structure of the Chicago Avenue Armory as a transformative space. 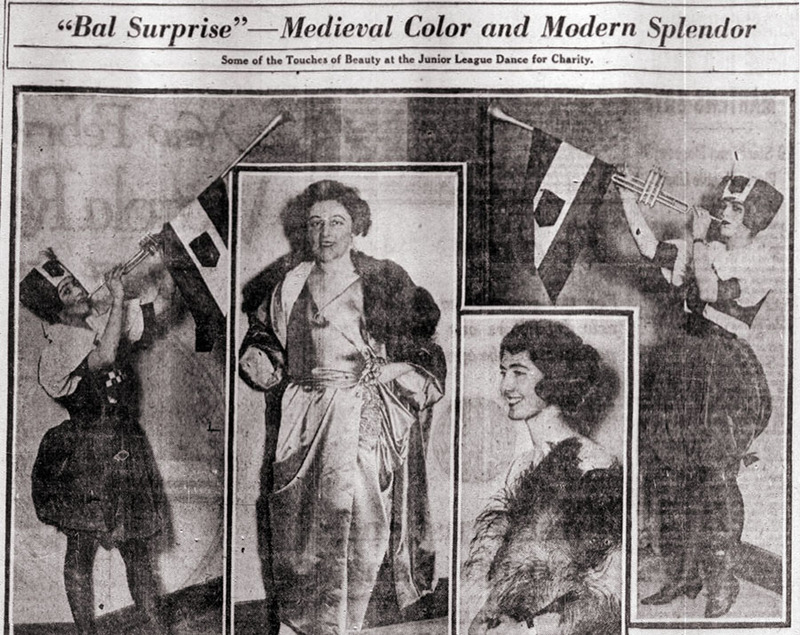 In this 1920 event held in the original eastern portion of the armory where Chicago's elite held galas and benefits for 70 years, the Junior League exploited the new medieval structure to create a period event that featured tableaux vivants that contrasted with their modern attire and complimented their modern sensibilities. In a twist on the MCA's artist activated space, Chicago Art Institute students arranged the tableaux. 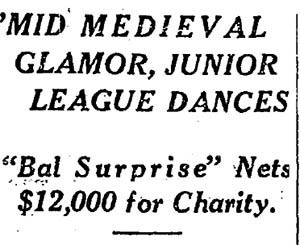 If it had not been for the modern dress of the guests at the Junior league “Bal Surprise” last night, one would have imagined one’s self at a ball in a medieval castle. The new First artillery armory, the scene of last night’s revel, is of medieval architecture and the members of the league, who acted as hostesses, were gowned in the picturesque modes of those days of long ago. In long trained gowns with basques and tall pointed or square headdresses, they looked as if they had stepped out of the frames of old paintings of the fourteenth or fifteenth century. They were divided into two groups; the ushers, whose duty it was to see that everyone present enjoyed the party to the utmost, and the cushion bearers, who between the dances flung gaily colored cushions on the floor so that the guests might be seated during the “tableaux vivants,” which were the “piece de resistance” of the affair. The tableaux, seven in number were shown in a large gilt frame which was hung at one end of the ballroom behind curtains of star dotted midnight blue. Mrs. Howard Linn chairman of the ball, was assisted in arranging the tableax by Abram Poole and by several artists from the Art institute, Randall Davey, Harman Rosse, Allan C. Philbrick, and John W. Norton. The 45x180 foot vaulted ceiling ballroom lent a gothic charm to a myriad of themed affairs. 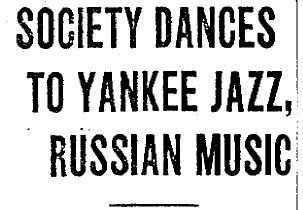 The black eagle of Russia and the American flag hung at each end of the ballroom where an American orchestra, in a colorful Russian painted setting, played American ragtime, and Russians gave a lively Russian program of singing, dancing, and instrumental music. A group of Chicago debutantes, all garbed in gay, colored shawls sold programs, flowers, and cigarettes, to add to the proceeds of the affair which is to help establish a fund for the aid of indigent Russians arriving in Chicago, unable, because of their ignorance of our language to find employment. One of the first groups to arrive at the armory were the guests of Mr. and Mrs. Stanley Field, who had taken two of the boxes, roped-off spaces containing gilt chairs. Between the Potter Palmer contingent of boxes and the Walter R. Kirk's was one placarded H.R.H. Prince Paul of Greece. "Gents, check yer guns!" was one of the mildest admonitions sounding the keynote of the Forty-Niners' party last night at the Black Eye dance hall [the 122d field artillery armory], where society played at living in the gold rush days, for the benefit of the Lower North Community council. A bar with a pipe rail and sawdust flanked one end of the hall, which was decorated with other signs characteristic of the period. There was a box row skirting the hall, and occupied by those who were not costumed for the festivity. These included Mrs. Rockefeller McCormick, and Mrs. Chauncey Blair. Barret Wendell in a ten gallon hat, a bold green shirt, and an enormous badge, was sheriff and Miss Frieda Foltz, one of the prime movers of the affair, was a dance hall queen in black lace. 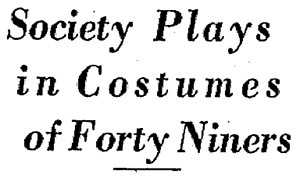 Mrs. Randolph Payson in a cowgirl outfit served soft drinks and tended the cashier box at the bar, and Princess Cantcuzene, one of the co-chairmen of the dance, wore white with a blue shawl. Boyd Hill's ferocious side whiskers and bear greased hair were something to have made any forty-nine gambler sit up and take notice. Walter Frazier was a desperado or perhaps a miner with a plaid shirt, red galluses and a black eye, and Prince Nicholas Galitzine was one of the sheriff's henchmen. By 10:30 Saturday night, the bathtub gin was gone. All 40 gallons of it drained from the red cast-iron tub that added so nicely to the ambiance of the stairwell of the Chicago Avenue Armory. This year's $55-a-ticket bash, which raised about $30,000 for Lincoln Park Zoo's very own barnyard, was dubbed the Bootlegger's Bash. True to the promises of the invitation, tub of gin awaited guests on the third-floor landing of a dizzying five-flight climb to the top of the armory. "What a thoughtful distraction from the nuisance of going up these steps," remarked a short-winded lawyer, reaching for a cup of sustenance. Once in the cavernous arched room, the former mess hall of the Illinois state guard, guests stoked up for a night of cavorting. Within a couple hours they had downed 126 pounds of Maryland ham, 700 oysters on the half shell, 100 pounds of blackened filet, crabcakes, cheese pudding, buttermilk biscuits, apricot brandy fruit tarts and baskets bulging with strawberries. When you're trying to get people to spend $175 per ticket fo a formal benefiting an architectural cause, you can't just hold the event in some mundane hotel ballroom frequented by conventioneers and other hoi polloi. So, you offer them some place like the Chicago Avenue Armory, which has a funky, horsey, military ambiance tht could hardly been more offbeat. ...guests will enter the armory on the Pearson Street side and ascend a winding stairway to a third floor gymnasium for 7pm cocktails. Waiters posted at every landing of the stairway will serve champagne to climbers who feel the need of sustenance. The towering stairwell will be draped with netting and roses, and eerie organ music will add a little zest to the scene. Dining at 8:30pm and dancing will follow in the armory's high-ceilinged, red-draped fifth floor ballroom, where long dinner tables will be set up in mess hall style. The rest of the massive building is an interesting odd hodgepodge of old and new fixtures and equipment and color schemes that could only have been achieved with war surplus paint. Off in a dark corner in an area remote from the ballroom is one thing most guests will miss: A glass case containing a stuffed (but once living) dog long beloved as a mascot of the 122d Field Artillery. The dog is a little spooky, too.